With all the hysteria about Russia, whose alleged meddling in the last election appears to be of little consequence, the media is ignoring the more serious case of rigging an election. The DNC used rules since the McGovern era, and then further altered the rules, to essentially clear the field for Hillary Clinton and try to prevent a successful challenge to her coronation. While there are no signs of serious reform at the DNC, it does look like they are paying for their actions when it comes to fund raising. After a strong $12.2 million raised in March — the first full month of Perez’s chairmanship — fundraising has dried up considerably. The $4.7 million it raised in April was the lowest for that particular month since 2009. The $4.3 million raised in May was the worst for that month since 2003. 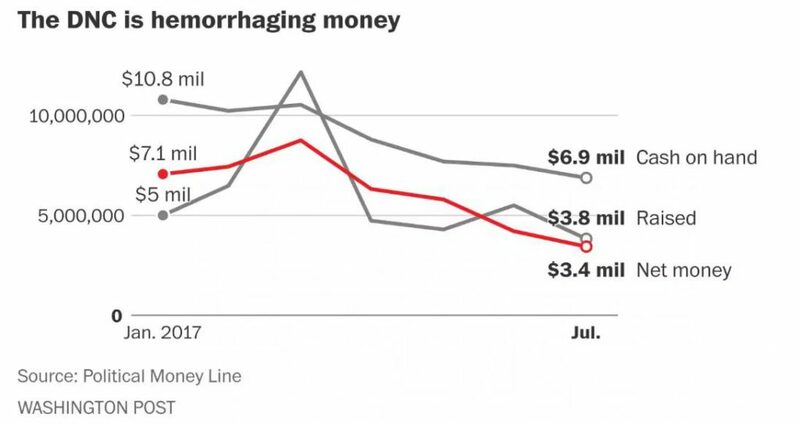 And now the $3.8 million raised in July is the worst for any month since January 2009. For comparison’s sake, here’s what the Republican National Committee’s balance sheet looks like this year. It has raised at least $9.5 million each month and carries no debt. Its cash on hand has risen from about $37 million in January to $47.1 million today — more than 13 times the net money that the DNC has available. The DNC has acknowledged they have rebuilding to do and that the party’s brand has been damaged after years of neglect and controversies, including its hacked emails — which led to top donor’s personal information being posted online — and its handling of the presidential primary process last year. Staffing had reached an all-time low when Perez took over about six months ago, and a new finance director and CEO didn’t start until earlier this summer. It is hardly surprising that after the catastrophes of 2016, including how the DNC essentially rigged the nomination for a candidate so terrible that she could not even beat Donald Trump, people would be reluctant to donate to them. While opposition to Donald Trump will help the party short run, they also need to stand for something other than opposing whatever Republicans are in office if they are to truly rebuild. After all, during the Bush years they raised money by campaigning against George Bush, and then backed a neocon war monger in 2016 with essentially the same agenda which they previously opposed. They are further showing how they stand for little beyond trying to win elections as they argue over whether they should support anti-abortion candidates. Posted in Bernie Sanders, Democrats, Donald Trump, George Bush, Hillary Clinton, Politics. Tags: Bernie Sanders, Democrats, Donald Trump, George Bush, Hillary Clinton, Politics, Republicans, Russia, Wikileaks. RSS feed for comments on this post.. TrackBack URL. They are paying a price because REAL DEMOCRATS refuse to give their money as a protest for the coddling of sanders who isn't even a member of the party . or they are refusing to give them money because the democratic party has betrayed the real left one too many times and has lost the right to be supported by them. “DNC rigged primaries for Hillary” is Russian disinformation, which all too many supporters of Sen Sanders were eager to swallow and seem unwilling to give up. So Joel thinks that all of the rules changes in the Democratic Party since McGovern are just Russian disinformation. Joel thinks that Superdelegates are Russian information. He thinks that front loading of Southern states is Russian disinformation. He thinks that the restrictions in number of debates in 2016 is Russian disinformation. He thinks that the changes in fund raising rules in 2016 to help Clinton is Russian disinformation. He thinks that the change in the reporting of the results of the Iowa caucus in 2016 compared to 2008 to help Clinton was Russian disinformation. He thinks that Harry Reid’s actions in Nevada are Russian disinformation. He thinks that leaking debate questions to Clinton by a member of the DNC is Russian disinformation. Sorry Joel. Besides all the examples of how the DNC manipulates the primary results, the leaked Wikileaks email shows that the primaries were rigged. Tom Perez has admitted the nomination was rigged for Clinton. The DNC’s own lawyers admitted that the nomination was rigged and justified doing so in the class action suit against the DNC. Blaming facts on Russian disinformation is something which Clinton supporter swallow and seem unwilling to give up. But that isn’t true. In August 2015, I learned that Bernie Sanders was running for President. I said, YAY, but I wanted to know more about him, so I set up a Google News alert not long after. Every article that contained his name ended up in my inbox. I considered SCORES of news sources for MONTHS before I was willing to say that the DNC had fixed the primary. The so-called Russian Hack exposed exactly what the NDC and HRC had done. Did the Democratic leadership make things right? No! They made up a story to discredit their bad acts by pinning them on the convenient bogeyman Russia. Today, Bernie Sanders is still the most popular politician in the US. According to the Harris-Harvard poll Bernie is at 54%. Hillary is up there too at 42%. BUT her unfavorable is 53%! Bernie's unfavorable is 36%. Even more shocking, Hillary's unfavorable at 53% is only beating DT by two points. His unfavorable, at the top of that list, is 55%. The DNC needs to wake up and smell the coffee. The two party leaders, Pelosi and Schumer, are in the basement. One final note: it does not matter who spilled the beans. Those beans are the truth.